Throughout GFS there are many places that are hidden to the student body; Places that are restricted to students. I ventured into these places, peered around, planning to make them public. These are the many fascinating secrets I uncovered. First, the Alumni Building used to be a YMCA. On the second floor, through the double doors was an open gym, there were no inside walls. In the basement there was a bowling alley. The lanes and bowling balls still remain. The paint on the lanes also remains. Today, it is used as a storage facility, but the bowling alley aspects are still noticeable. On the third floor there are tiled floors indicating locker rooms. The third floor is no longer used for classes so students are not allowed up there. There are also rumors of a ghost in the alumni building, which may have been made up for a movie, and also a snake in the basement. Next to the alumni building where the science building is now there was an abandoned post office. Next to the post office, where the Hargroves Building is now, there was a cafe, Duva’s ,where students with off campus privileges used to smoke. One of the stories told here at GFS involves a snake and Cheryl Pinkus, or as many call her, Mrs. P. Mrs. P. is one of the first grade teachers. One day a snake from Geoffrey, one of the lower school science teachers, escaped from his room. 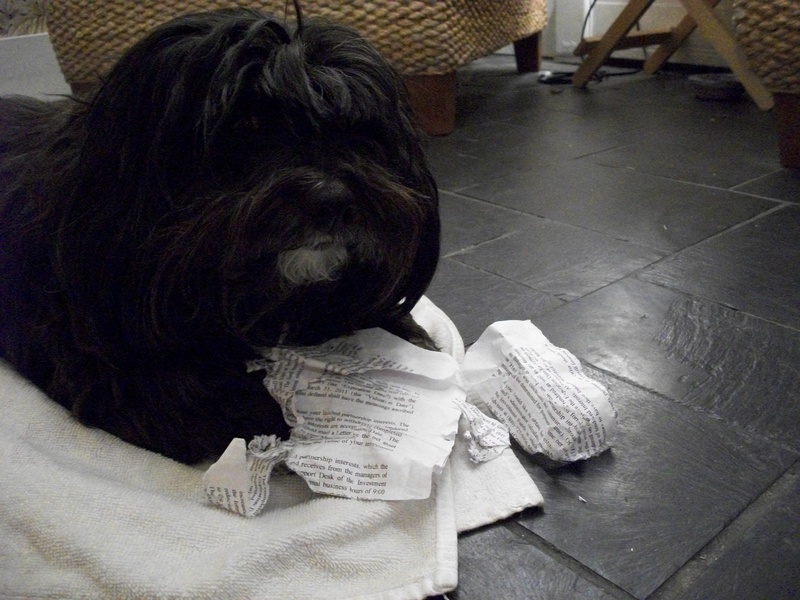 It eventually found itself in the Cary building, undetected, who knows how. Then when it entered the building it must have smelled food in Mrs. P’s closet because it ended up there. One day Mrs. P opened her closet , looked up, saw the snake and screamed for Mrs. Shechtman. 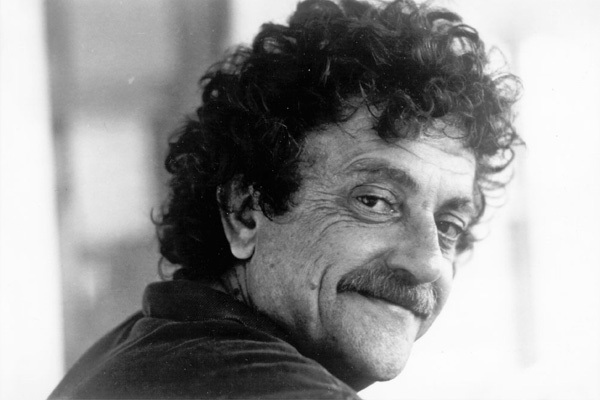 Another version of this story is Mrs. Shechtman was with Mrs. P. when she opened the closet. The Little and Smith gyms, and the middle nursery building and the big nursery building, all are connected. The Little Gym used to be called “The Gym” because it was the first and only gym. The Little Gym turned into the girls’ gym and the Smith Gym used to be the boys’ gym. The middle nursery building used to be the boys’ locker room with lockers floor to ceiling. The big nursery was also a locker room, but for girls. It also had lockers floor to ceiling. Outside the little gym there is a circular metal object in the cement. It is believed that is where we store the oil for the heating. The boiler tanks are under the library and the giant steam pipes that transfer the heat stretch all across campus. The name S-9 might sound very secretive and intriguing, but it’s not. Sorry to break it to you. Well here’s the story of it anyway. 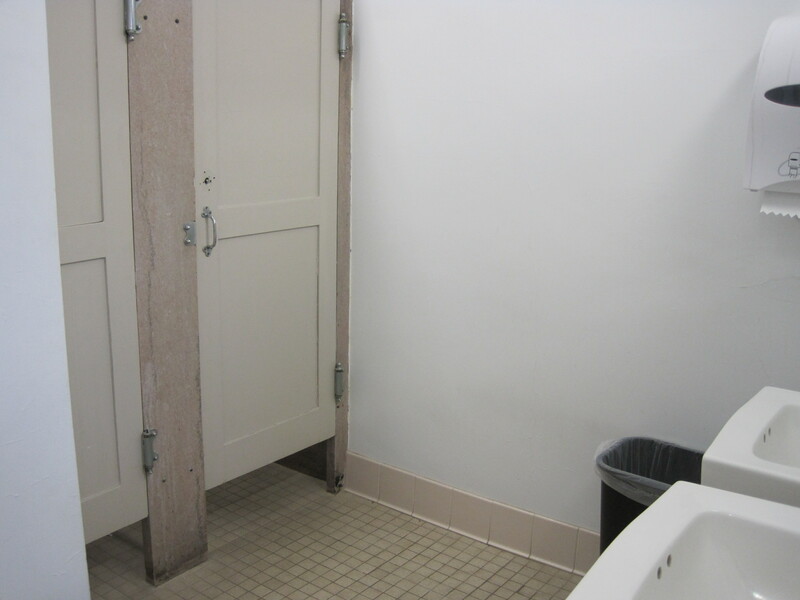 Do you think that the Sharpless building was designed to only have one bathroom? If you said yes, then you are wrong. S-9 was supposed to be a boys’ bathroom on the first floor of the Sharpless building across the hall from the 8th grade english room. It was decommissioned and used by Will Terry as a dark room for a couple of years. then Bob Miller claimed it as a graveyard for computers before they are recycled. That is what it is used for today. There are many secrets at GFS, but it is no secret that there are many GFS teachers that graduated from here . Here are a few; Tom Levy, Dorothy Cary, and Kate Hanssen. All three have mothers working at GFS. Others include Jenny Stetzer Goldberg, the former 7th grade history teacher, and Ian Van Wert. Brandon Jones, and Michael Boorse from athletics also attended. Sally West Williams, Meg Cohen Ragas, Diane Mallery, and Stacey Minyard from development attended GFS. Finally Kathy Paulmier attended GFS. 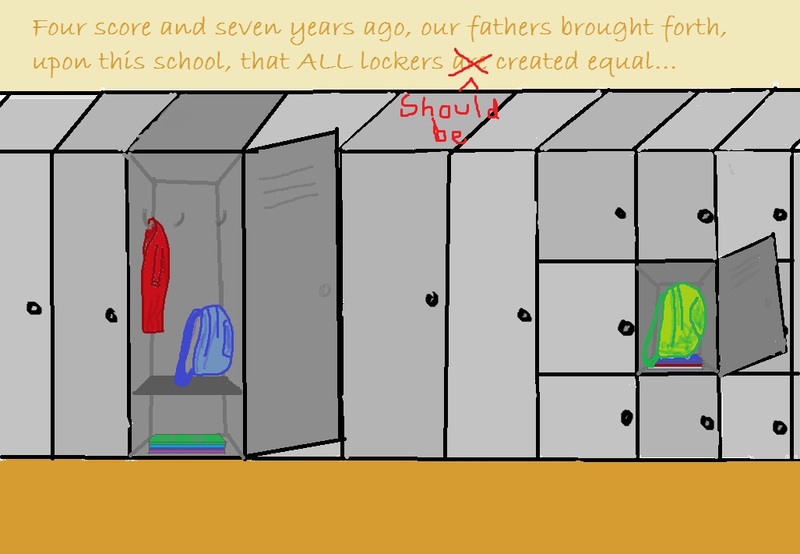 Equality is a Quaker testimony, but at GFS, we have inequality in the assignment of lockers. Why should some people have bigger lockers than others? It’s Monday. A student comes in to school and opens up their locker. It’s about a foot and a half wide cube. He moves books around from his backpack to his locker and puts his coat in. He jams his sports bag in too. Then he attempts to put his squash racquet in his locker, but sighs as it is too long for the locker, and brings it into his homeroom. Downstairs, a girl opens her four-foot tall, eight inch wide locker and hangs up her coat. A door above her head opens to a compartment of a one foot wide cube. She stashes her unnecessary books and hangs her squash racket next to her coat. She attempts to put her sports bag in the locker too, but the locker is too thin, and she sighs as she brings it into her homeroom. Examining these two dilemmas of the lockers: Too thin and too short, I wonder: Which locker is better? In the tall thin lockers, like this girl has, she can easily fit her coat in her locker and access her books at the same time, while in the square locker like the boy has, he has to remove his coat if he wants to access his books again. In the tall lockers, there is also space for sports equipment, like a squash racket or a field hockey stick. The square lockers do have their advantages. The boy can fit his sports bag in his locker, if he squashes it in, but the girl’s locker is too thin. He can also fit larger items, like a box of cupcakes or a soccer ball. But how often do you bring that in? And why leave cupcakes in your locker? Examining the real estate of the two lockers, the tall, thin lockers seem to have more space, with 10,101 cubic inches, while the square lockers have 3,712.5 cubic inches. In theory, the tall thin lockers have more space to store things, and are better overall. Plus, they’re way bigger. 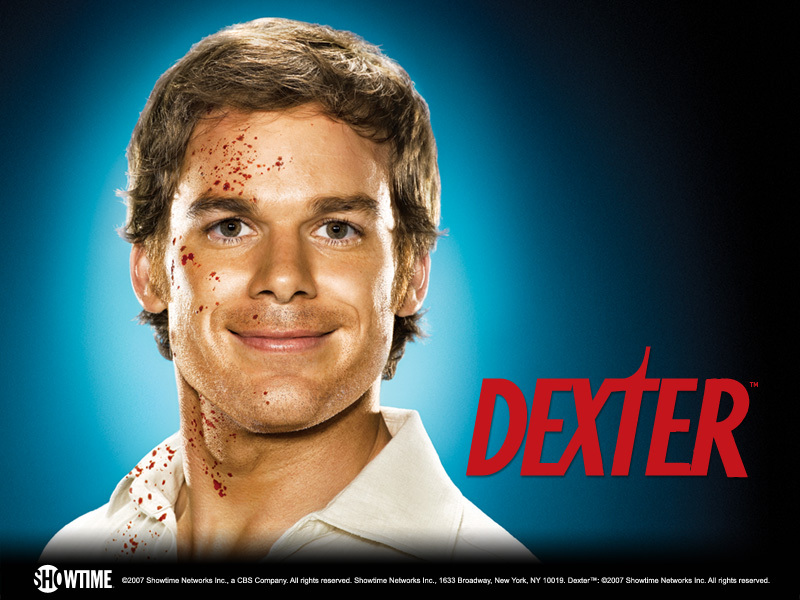 It’s time for sports. Two girls go into the locker room. They both open their lockers- one has a full locker, while the other has a half-locker. 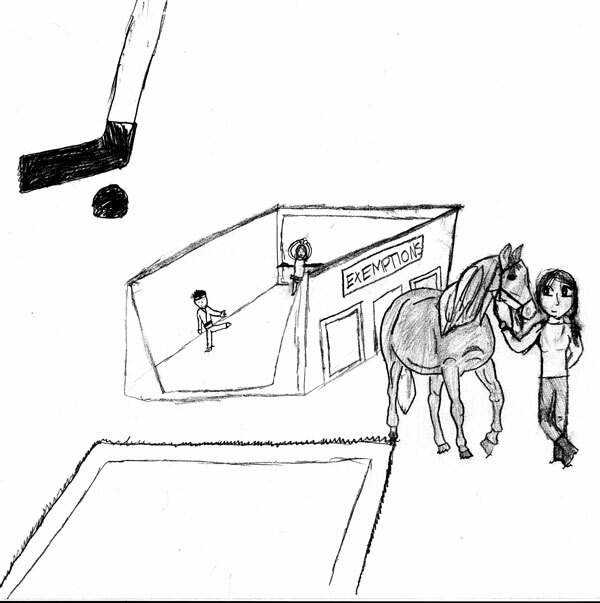 The girl with the half-locker pulls open the door and a pair of shorts and a basketball shoe fall out. She dumps her stuff on the bench, and changes. When she’s done, she puts her school clothes,(including the nice shirt she had to wear for an orchestra concert that day) sneakers, her coat and her lunch bag in a heap in the locker, and slams it closed before it all falls on her. She leaves her backpack on the floor outside the locker, and runs downstairs, before remembering her water bottle. She runs back up, opens her locker. Her coat falls on the floor, and she moves it to the side. She removes her clothing, (her shirt is wrinkled) sneakers and lunch box from the heap they make in the locker, and finds her water bottle in the bottom. She sets it on the bench and begins to stuff everything back in. Finally, she slams the locker closed and locks it, and leaves the locker room. Meanwhile, the girl with the full-length locker unlocks and opens the door. She changes and hangs her clothes and coat up on the hooks. Her boots go on the floor of the locker, and her lunch box and cell phone go on the shelf. She can’t fit her backpack either, but she sticks it under the bench. She locks her locker and begins to go downstairs, when she realizes she forgot her water bottle. She goes back to her locker and opens it up. Her water bottle is on the shelf, next to her lunch bag. Her shirt isn’t wrinkled, and she can probably get away with not having to wash and iron it before the next concert. She grabs her water bottle, closes the locker, and goes downstairs. We all know who the winner is here. The girl with the full length locker is clearly at an advantage. Her clothes stay neat, her stuff doesn’t go everywhere when she opens her locker, and she can get ready much faster than the other girl. It seems like there are plenty of lockers in the locker room. Why do we have small ones? In fifth grade, we were told we had small gym lockers because the older students had bags and more stuff. It seems like we have plenty of lockers, and lots of people don’t use or even know they have lockers assigned to them. Why should they have lockers that somebody who uses their locker wishes they had? And how is it practicing equality to have such different facilities for different people? Over the past weekend. Germantown Friends School was very well represented by all sports teams in their various tournaments. One of these teams was the Middle school wrestling team. The team had a very good beginning to the season starting 6-0. They finished the season 7-2, and were ready for the upcoming annual Springfield Tournament. This was where 6 public and private school wrestled to win trophies in their weight class. Every person on the team took home a trophy. Whether it was a 1st, 2nd, 3rd, or 4th place trophy everyone on the team received one. Seventh Grader Tony Verruto won first place for his weight class and 7th Grader Josh Berg took second. 8th grader s Andrew Wilson and Peter Jarka-Sellers battled back from early losses to win 3rd and 4th place trophies in their respective weight classes. Another sport that was successful was boy’s squash. They went to the nationals over the weekend that were located in New Port, Connecticut. They won an easy first-round match against Edgewood School. In the second-round, they suffered a tough loss to Chestnut Hill Academy. They later redeemed themselves with wins against Pingry and Middle School 45 in New York City. They ended up taking fifth place, meaning they were the fifth best team in the Nation, which is pretty amazing. Boy’s Basketball also had a very sucessful weekend. They visited The Philadelphia School for a tournament with four schools. IN the first round they beat Friend’s Central easily. After that, came the finals. They had to face The Philadelphia School at their court. After support from all team members, they won a very close game and took home the trophy!!! This was a very great winter for GFS sports teams. Everyone ended up taking home some medals. Almost everyone thinks that Hershey chocolate is great, but it’s not very nice tasting in my opinion. Most of us only know of big companies like Hershey and Lindt. I think Lindt is better than Hershey, but it is still mediocre compared to some European chocolates. 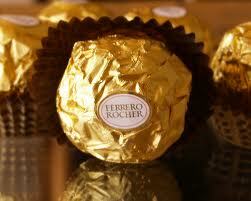 In the best chocolates, the taste dissolves quickly. This is because the chocolates that dissolve faster have smoother textures. In this author’s opinion, Hershey chocolate is barely chocolate. If you tried melting a Hershey kiss in the oven it wouldn’t work, and it would just become dry and crumbly. If you tried just leaving it in your mouth to melt, without chewing it, it will not melt for a while. Good chocolate melts in your mouth within a minute. You shouldn’t chew it unless there are nuts or caramel. Hershey mostly sells milk chocolate. So, if it is milk chocolate, dark chocolate from other companies should melt slower than their milk chocolate because it has milk and cream in it, but it doesn’t. Also Hershey’s “special dark” isn’t even dark chocolate, it’s just looks dark. Their “special dark” is sweeter than their milk chocolate. Good dark chocolate has just enough sugar and milk so that it’s not bitter, but not sweet. Hershey just makes all their chocolate so that they will please kids, who like sweetness. While doing this they stopped creating good, genuine chocolate. Also, everyone says that chocolate is made of cocoa beans, when actually it comes from cacao beans. Cocoa is the powder used to make hot chocolate. Chocolate is made from Chocolate liqueur, chocolate butter, sugar, and milk. There are several types of chocolate unsweetened, semi-sweet, bittersweet, sweetened, milk, and white. White chocolate is technically not chocolate, because there isn’t any chocolate in it. Here’s a table of well-known chocolate makers and how I rate their chocolate. On the table above I rated Lindt as 5.75 because it’s a good basic chocolate, but it doesn’t have the smooth texture of the finest chocolate. I put Dove as 4.5 because it doesn’t taste bad, but doesn’t melt well. Ferrero Rocher and Ghirardelli( both Italian chocolates) were even because Ferrero Rocher has good texture, and Ghirardelli melts quickly and tastes good. Now that you know a bit more about chocolate, go get a taste of chocolate and don’t chew. With help from Owen Chung and Elizabeth Wallace. The rating is done in rolls of toilet paper, out of five. Home sweet home. 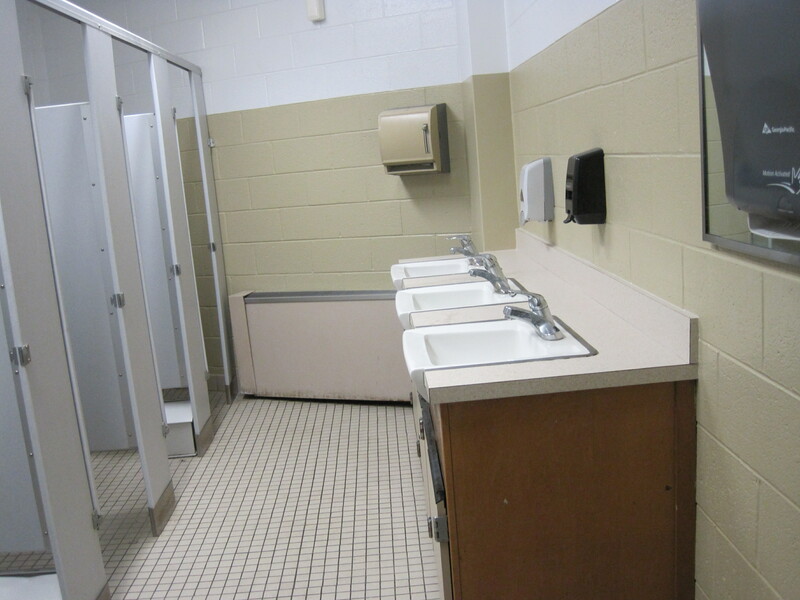 This bathroom, convenient for most middle schoolers, is functional and well-used. The soap dispenser is sometimes out, and the automatic paper towel dispenser is hard to use (which can be embarrassing). The facilities work well, though, and toilets are rarely clogged, if ever. The dark grout and lack of windows detract from the environment, but overall is fine. Not new, but works fine. No windows, ugly mustard yellow walls. Counter gets wet often. 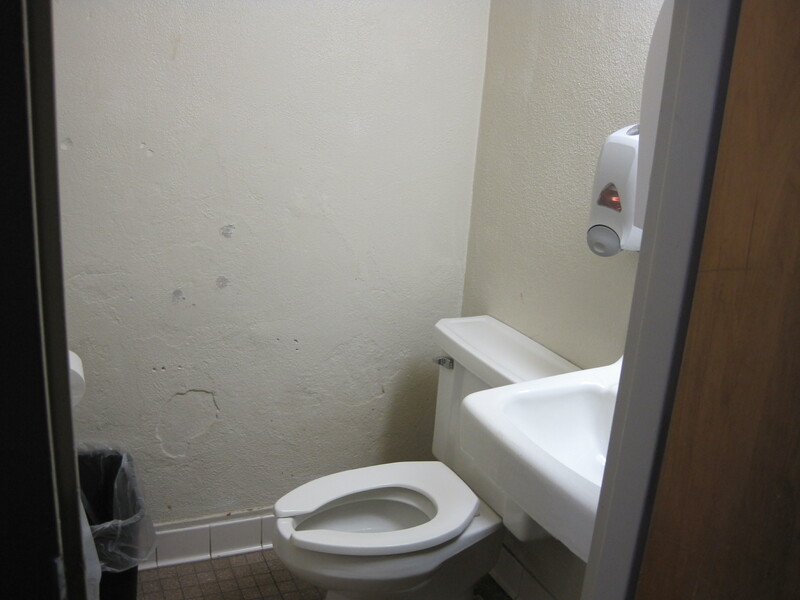 This potty is not used much, so it is quite clean, and in a good location if you are in the Alumni Building. It has nice, natural light from the window. 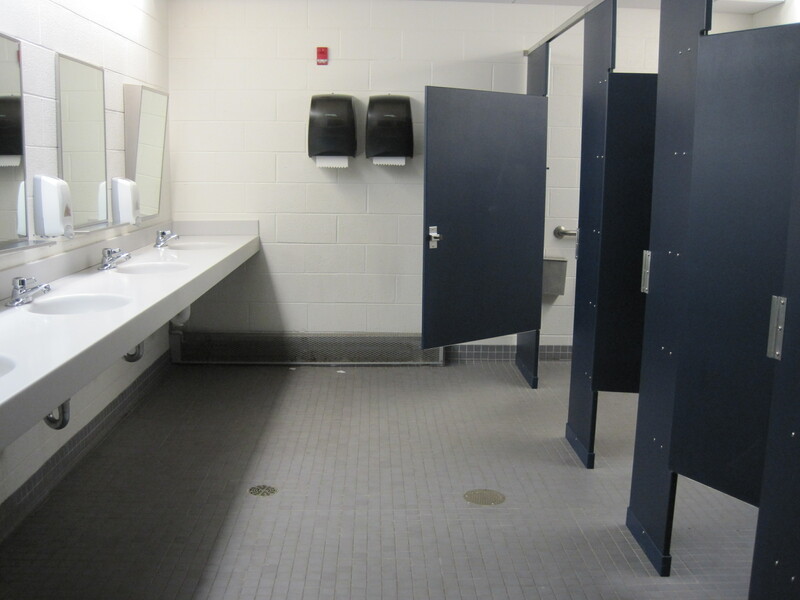 The only drawbacks are the paper towels on the floor by the garbage can and the lock on one of the stall doors being fidgety. Beware of the steps by the door of this bathroom. When you enter the room, you have to walk down two steps, which, according to Owen, he almost fell down. Overall nice and clean. This restroom is a big improvement on what it used to be. The walls are freshly painted (last year the walls sported yellow wallpaper with giant pink and purple flowers), and the bathroom is clean. The floor dark red linoleum, so you can’t quite tell if it is dirty or not, but the bathroom overall is nice and well-kept. Far away from the cafeteria, down a few hallways, so if you don’t know where it is, you had better ask someone, because you won’t find it on your own. Everything is new and clean in this loo. It’s well lit and nicely laid out so you don’t feel cramped or trapped. (It’s also easy to take a good photo of it.) If you’re in the Field House already, the bathroom is easy to get to, and it’s not a puzzle to find it. All right bathroom, the facilities are new and work. No windows and trash are drawbacks, but everything is clean and bright. The bathroom in the basement of the Smith Gym smells like sweat, probably because it is right next to the wrestling room. Even though it says Ladies’ on the door, nobody cares if boys use it, and most people don’t even know the sign is there. It’s a single-toilet bathroom, but is smaller than most, so don’t go here if you’re claustrophobic. The yellow walls make the experience more unpleasant, and Owen claims he once saw a cockroach in it, even if it was dead. The bathroom also has a leaky faucet. 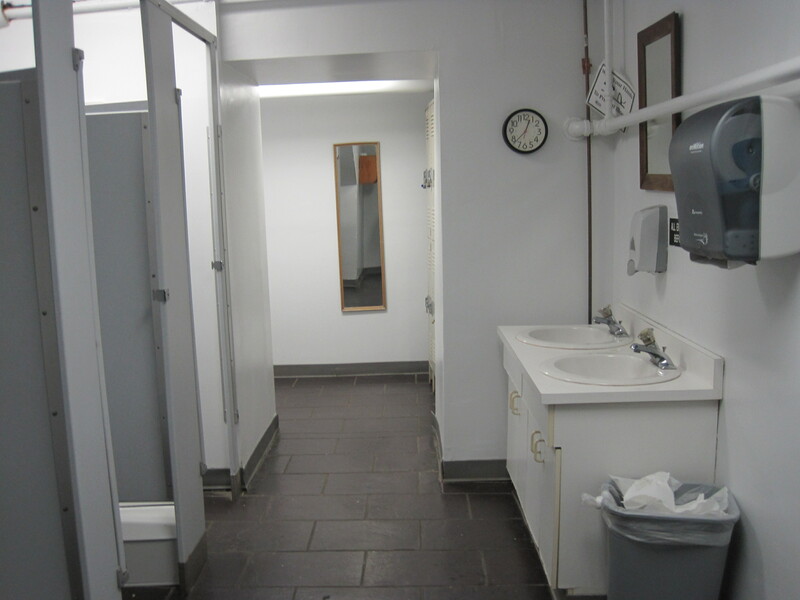 This bathroom is used on certain occasions (like intermission of plays) by a lot of people, but is not used much, or at all, for long periods of time. The bathroom is clean and works well, but it has a bad smell of human feces. The venting is not great. 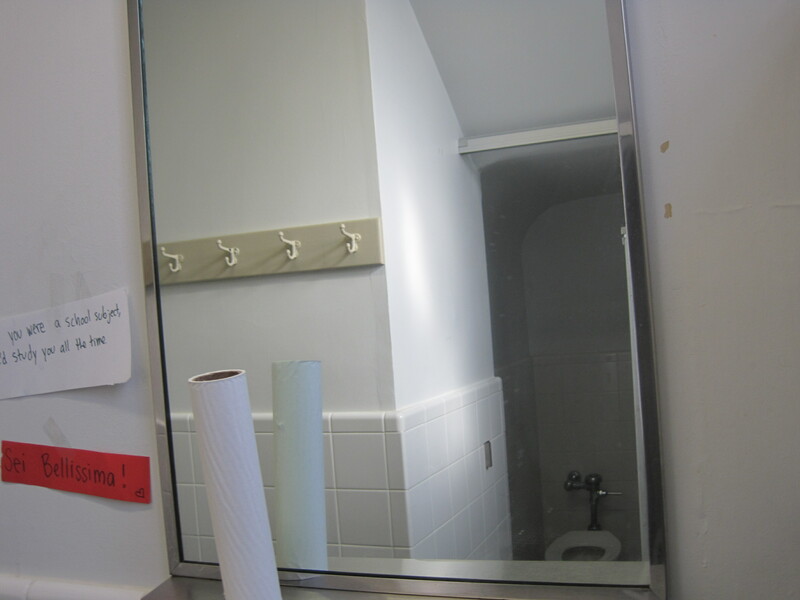 This is the scariest lavatory on campus. It’s probably where Myrtle spends most of her time. 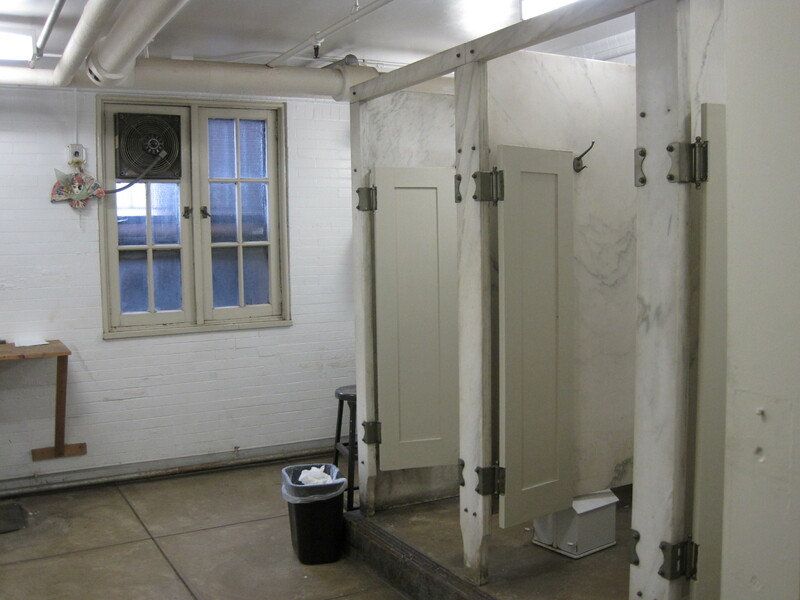 The lavatory, though only used by actors during plays, is dirty and badly kept. 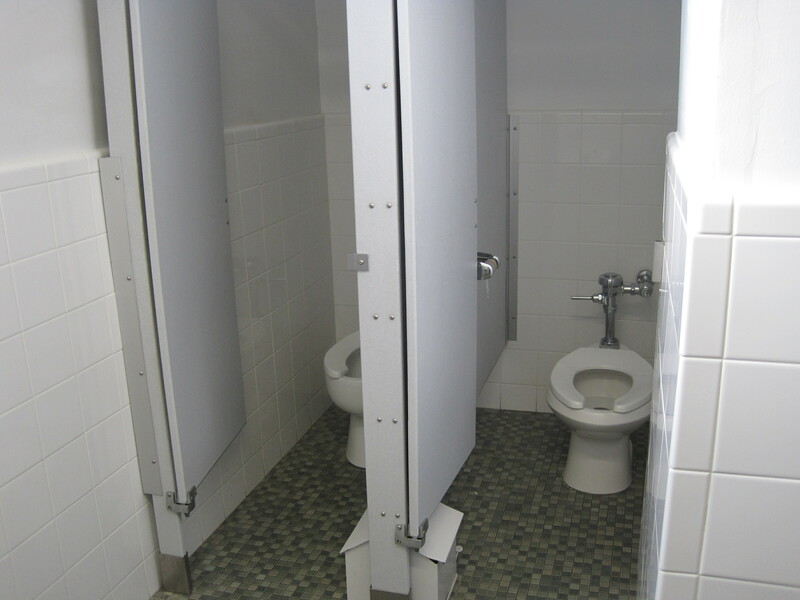 The majority of the toilets are clogged most of the time, and the stall doors are western-style, so they lock in the middle. Some of the doors don’t even lock, so you have to have somebody hold the doors closed for you. 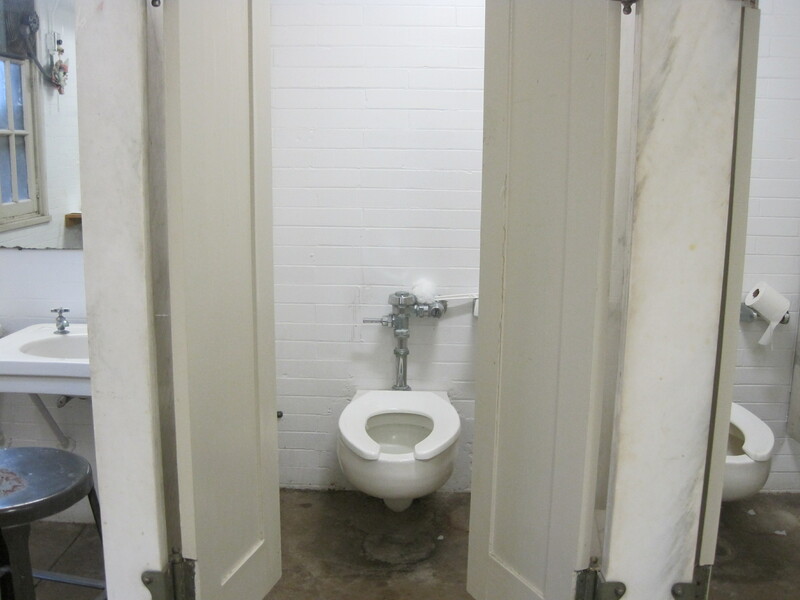 The lavatory is also unisex, so it can be a bit awkward during intermission of upper school theater productions. Lisa Burns, the theatrical director, once broke her nose down there, so be careful. Since the lavatory is in the basement, the floor is concrete, and the lavatory is damp despite the fan. Nobody is actually supposed to go in the basement lavatory except for during productions, so thankfully, most middle schoolers won’t be going there any time soon. 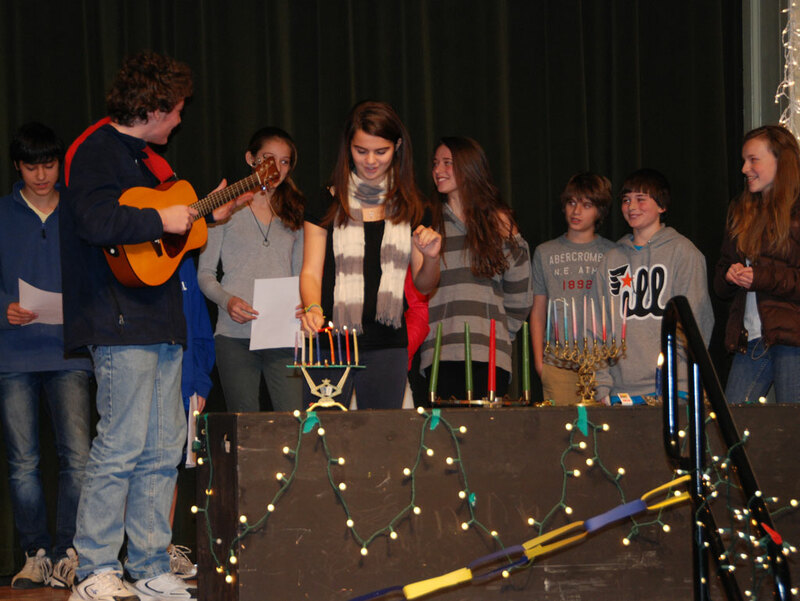 When one hears the expression “festival of lights” it conjures up pictures of well…. festivals. But the Festival of lights here at GFS was so much more. Whether it was “Let it Be” performed on stage or “Lean on Me” or even the simple beauty of the decoration that pulled it together. I for one enjoyed the speeches about the holidays and the many wonderful musical numbers. I would also like to point out that it seemed everyone performed. And they performed so well it made small mess ups funny. I literally laughed out loud when such comedies occurred like the pronunciation of Sleipnir (slap-ner). Or when the cape of the eight dancing woman fell off in 12 days of Christmas. When I talk it sounds like there was only music but there was something for everyone. There were speeches, interpretive dances, and a magnificent finale of “this little light of mine”. I sincerely hope you agree with me on how wondrous this performance was. If you did see it you will definitely understand me and if you didn’t then you have missed a once-in-a-lifetime event….until next year that is!